After the successful re-introduction of Wispa, Cadbury's have decided to bring back a much loved variant - Wispa Gold. 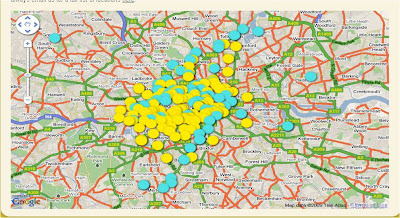 This is all through a site at wispagoldmessages.com and "whether you just want to say 'hi' to a special friend who lives in a different city, or wish your Mum Happy 60th Birthday, now is your chance. All you have to do is submit your special ‘gold’ standard message along with an explanation of why it is so special, and let us know which city you would like your billboard to appear in." 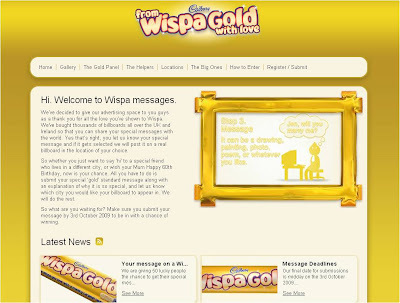 The Wispa Gold Messages site is live from today until 3rd October 2009 and Wispa Gold 'Helpers' are on standby for those who need creative support in producing their message. This is a progression of the original Wispa work and is a simple, but effective way of integrating digital and traditional media to produce a result that should be greater than the sum of it's parts - the impacts from the posters will be amplified by the word of mouth / buzz generated by the public involvement in the creative execution. .....but the best thing is the return of an old favourite, I'm sure I'll be eating more than my fair share in coming weeks!